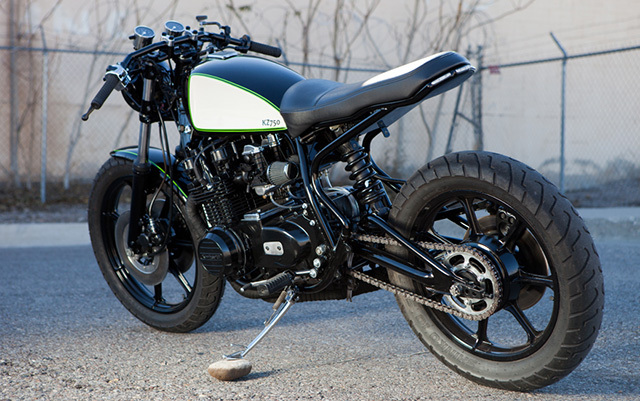 We all come to this obsession with motorcycles in different ways, for Matthew Ortiz of Swerve Customs out of Albuquerque, New Mexico it was the realisation that less is more. 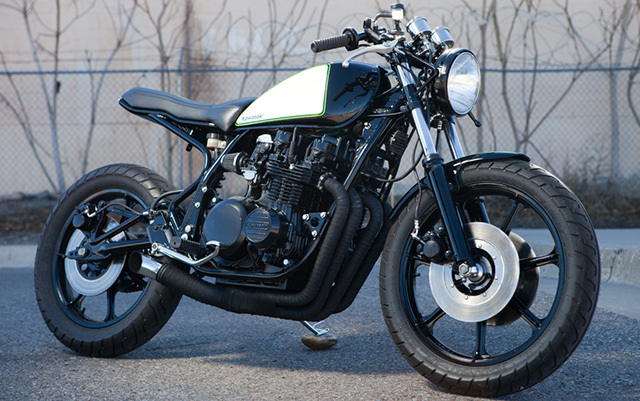 Two less wheels in fact and Matthew discovered his abilities to heavily customise and modify cars translated perfectly to bikes and the result is this stunning 1980 Kawasaki Kz750 LTD all built in his single car garage. “It wasn’t until my first “vintage bike” that I realised that what I had been doing to cars all these years (restoring, modifying, lifting, fabricating) I could be doing to motorcycles. It was a 1978 Honda cb400 Hawk that I got for $500. The first time I brought it back to life, I did everything in my apartment parking lot. When I was done I was so stoked!! Something had changed in me, I wanted to build another one” Enthuses Matthew. After the Honda came a host of other bikes, a move of location and the acquisition of enough tools and skills to set up his small shop known as Swerve Customs. 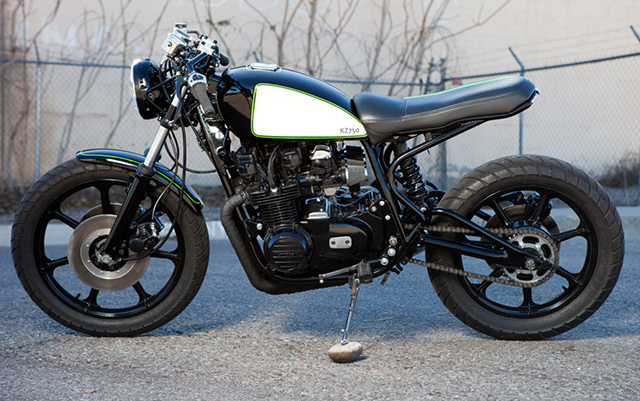 From cafe racers to bobbers and even choppers, Swerve does it all but this Kawasaki shows off not only Matthews skills on the tools but his ability to think outside the box to create bikes that perform as well as they look. But first the Kawasaki that arrived in the shop with no heart beat to it’s engine and plenty of battle scars had to be stripped down before it could be reborn! With the Kwaka in pieces the visualisation process could begin, there is no design process or sketching, just a total hands on approach to building bikes the way it used to be done. The frame has been cleaned up, detabbed and smoothed out before being given a coat of black to begin the process of piecing back together an all new take on the old LTD. The largest piece of frame modification was saved for the rear subframe, with the original rear of the frame completely cut off and Matthew starting from scratch. Forming each piece without any drawn up design the look is both organic in it’s flowing lines and ultra clean with the smooth round stock creating a far more compact image than the squared up original. With the subframe attached to the main frame, mounts for the battery and electronics were designed so they could be hidden under the new rear end. With the functional necessities out of the way Matthew fabricated a custom seat pan that has been padded and wrapped in black leather with a gap free finish. The standard tank didn’t go untouched with the sides neatly scalloped before the paint work was laid down. Those sides received a coat of white broken up with classic Kawasaki green pin-stripping before the main black hue finishes off the classy look. 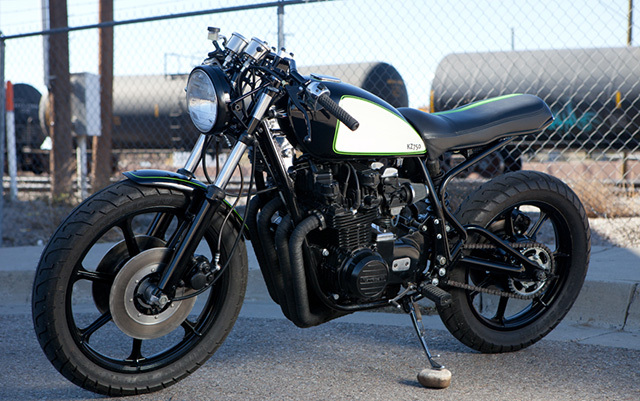 To get the look and ride height he was after Matthew swapped out the rolling stock of a similar vintage, the more sporty Kz650sr, including it’s wheels and suspension setup. Once that was done it was time to add some serious fabrication tricks to the process and construction of a new swingarm began to replace the old two shock setup and brilliantly matches the subframe design. Not only does this bring the advantages of the mono-shock with less moving parts, less friction and less overall shock travel, it allows for the fitment of a modern unit with far superior technology than the ’70s pogo sticks. The one off design is reinforced for extra rigidity and designed around the new shock which was taken from a Honda CBR929 for superior performance with the spring finished in paint scheme matching black. With the bike a non-runner when Matthew bought it made sense given that he’d stripped the bike right back to rebuild the engine and throw a new seal kit at it too. The twin cam 738cc four cylinder might be more than 30 years old in design but it still punches out some impressive numbers with a desire to rev through all the gears and even with the weight of a fully loaded LTD run a 12second quarter mile. The overhauled engine is supplied its fuel/air mix through a bank of four Keihin carbs breathing through pod filters. For a drastically cleaner look the exhaust no longer uses the big twin mufflers and exists out just the right hand side with the four heat wrapped pipes ending in a single side facing droopy tip that is sure to wake the neighbours. A Dyna ignition, coil and wires brings the electronics into the 21st century and adds reliability to a mechanically dependable piece of kit. 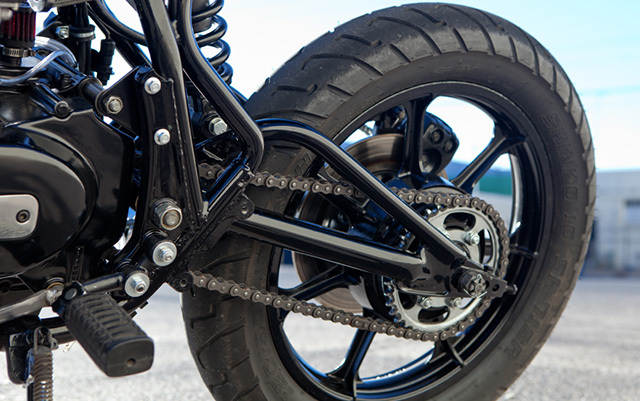 Apart from a few areas of clever polishing on parts like the fuel bowls the rest of the engine is murdered out in all black for a tough look that adds an extra element of muscle to the build. To steer the beast Matthew could have hit eBay or the millions of bike shops that stock the very easy to find clubman bars, but when you’ve fabricated so much else on a project why leave the little things to others. The result are clubman like bars with squarer angles to match the vintage of the Kwaka and support the new grips, levers, master cylinder and refurbished switchblocks. 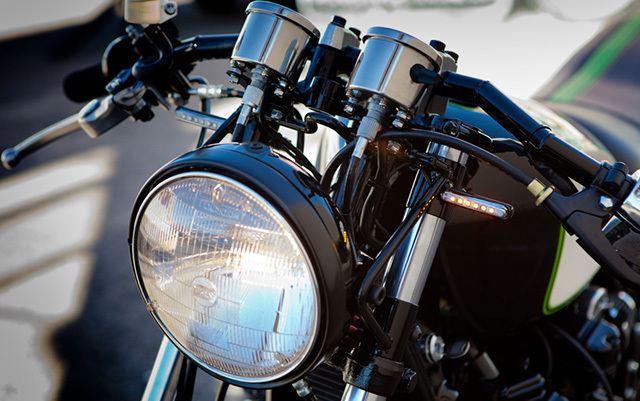 Lighting is a mix of old and new with LEDs in the tail and on the front forks with a classic round headlight lighting up the deserts of New Mexico! For Matthew and Swerve Customs it’s about getting back to the basics, a no nonsense approach to building great bikes and riding them hard! “For me there is nothing like taking a motorcycle completely apart, cutting, welding, wrenching, painting, grinding, bleeding, and struggling at times. Then to put it all back together in it’s new form that you’ve created, and actually ride it! And have it look good and ride great.” In a high technology society in a fast growing global economy sometimes there is still no substitute for a few tools, hard work and dirty hands!